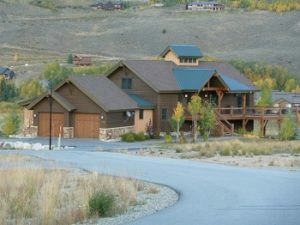 Fox Valley Ranch at Three Peaks are golf course homes for sale in Silverthorne CO Real Estate. These Silverthorne homes can be found on Kestral Lane and Talon Circle near the Raven at Three Peaks Golf Course. There are 30 residential lots and 4 open space areas in Fox Valley Ranch. Lot sizes range from 0.24 – 0.54 acres, of the 30 lots there are 11 vacant parcels. The 19 exisiting homes were built between 2005 – 2007 and have 3 – 4 bedrooms. These Silverthorne CO homes have amazing golf course and mountain views of Ptarmigan Peak. Many of the homes for sale in Fox Valley Ranch have superb finishes with granite slab counters, stainless steel appliances, stone fireplaces and beautifully finished wood floors throughout. Fox Valley Ranch at Three Peaks are spectacular homes for sale in Silverthorne Colorado Real Estate.